Doesn’t time fly? Is it time to review the state of the Northern League, the competition scene in the North of England, once again? It appears so. This year the review is a touch late as the data's only just been released. 2016 was the fifth consecutive year of decreasing participation. Surprisingly one round of the FOG AM competition was cancelled when not enough players were able to attend. 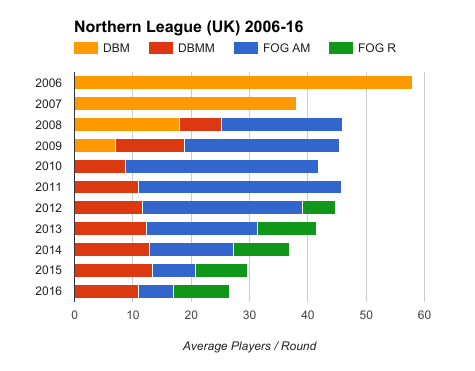 Both DBMM & FOG R have retained a stable core of players for the last five years or so. Although last year's DBMM attendance was down slightly the FOG R competition looks really stable. FOG AM participation suffered due to the cancellation of a round but even so the number of players has declined sharply over recent years. What was once a strong doubles competition was a singles competition for the second year running. There's not much to say about the underlying causes of the decline of the League that hasn't been said many times before. If you are interested in my thoughts do read last year's review. There will continue to be a FOG AM competition. Given the figures for 2016 and the cancelled fourth round I have to say I'm surprised by this. There will not be a 2017 FOG R competition. It will be "replaced" be an Art de la Guerre (ADLG) competition. I didn't really see the latter change coming. I suppose I should have: ADLG is rapidly gaining popularity in the UK with a number of well attended national competitions. Even so FOG R had a solid core of 6 players attending all rounds in 2016 so I can only assume that many of these wanted to switch to ADLG. Just as I get close to finishing a Transylvanian ally for an Early TYW German Protestant army the FOG R competition vanishes. I had planned to give them a run out in the League this summer. My only other option was 2017 Stoke Challenge but this has been cancelled due to sale of the venue! More positively, I, like many others, have 4-5 medieval armies that have been in storage for quite some time and I am pleased that I will be able to get games in the League this year. On balance I do hope that ADLG attracts a strong following and this boosts the overall participation in the League. For those interested (like me) the ADLG competition will be 3 two and a quarter hour games at 200 points rather than 2 three and a half hour games for the other rule sets. The first and last rounds will be open with the broad themes for the middle three rounds. At this stage I only know the date and venue for the first round: Sunday, 19 March 2017 in Leeds. Once all the dates are published I will post a link in the comments section.